Beef is tasty in all it various shapes, sizes and cuts, and frequently the cheapest/toughest cuts can be the most interesting. That is certainly the case here. 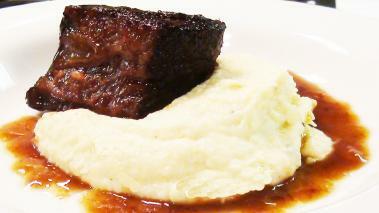 In this video recipe, I show you how to make a braised short rib with celery root puree. Short ribs are a tough cut of meat, that I never quickly sear and serve like I would other cuts of steak. Instead, I braise them slowly at low temperature, in wine and chicken stock, flavored with aromatic vegetables. At the end of a few hours, you end up with an extremely tender, flavorful piece of meat, that is well worth the wait. The meat pairs beautifully with the celery root puree, which is similar to mashed potatoes, but has its own unique flavor, and makes this a truly elegant recipe. It's a dish of cheaper ingredients that I'm now seeing all the time in the finest restaurants. Hope you enjoy it as much as I do. Finally, I like to finish the short rib in the broiler with some of the braising liquid basted on – that gets the edges crispy, and creates a great texture and flavor. Serve and enjoy!! The recipe does take some time, but it’s not a ton of work and it is a ton of flavor, definitely one of my favorites. Great! Tom Krueger treated me - his father-in-law and my wife, Vera, my daughter's, Tom's wife's, step-mother, to this dish a few days ago at their home in San Francisco. Ever since that repast, we have been obsessed with learnig how to prepare that dish ouurselves, so that our repeated enjoyment of brased short ribs not be contingent strictly upon our visits to Tom and Marina's San Francisco abode, but be possible at our far away Serbian home. We are glad to have access to this website, as it will certainly hep us impove our quality of life.